Designed primarily for girls, it would be no surprise to also see boys playing with the loveable Fijit Friends toys from Mattel. Available in four colours – purple, pink, green and blue – these characters are covered in a tactile soft skin that has a squidgy feel to it. Each different coloured Fijit Friend has different ears and voices as well as a unique personality. Each Fijit has over 150 phrases and jokes built in - and clever electronics means they have the ability to respond to 30 different commands from their owners. Better still, the seamlessly integrated Sonic Chirp Technology recognises external music and sounds from your TV, radio or sound system. Each sound will trigger the Fijit Friends to put on a little dance that’s sure to keep little girls amused for hours on end. 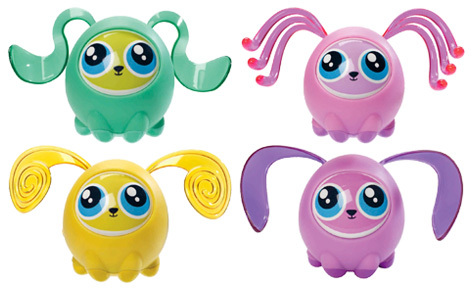 Following the huge success of Fijit Friends in 2011, 2012 will see the introduction of Fijit Friends Newbies that are best described as "pint-size" versions of the toys we already know and love. These little Fijits love to be doated over - and the more you nurture them the better they will perform. Place two of them side-by-side and they will sing a little tune together. All of the Newbies will also enable kids to unlock exclusive content from the Fijit Friends website. The Newbies aren't the only newbies on the block though! Fijit Friends Yippits are also vying for attention. There are four Yippits to collect: Skippa (green), Scooch (blue), Plooki (purple), and Patter (pink). Each one of these dancing pets can perform hilarious tricks when played with. They can also interact with eachother which makes for brilliantly unpredictable fun. Please tell us what you think of Fijit Friends by Mattel. My Dad brought me a Fijit Friend for Christmas and I love it because it has a unique dance. (Mine once stood on its back and bobbed its head back and forth.) I would highly recommend Fijit Friends for girls age 5-14 girls and especially Serefina because she is a real girly girl and sings and tells great jokes. However, there are some things that could improve it, such as more songs, more questions and more music for them to dance to.